Welcome back! I have a confession to make: I couldn’t do it. 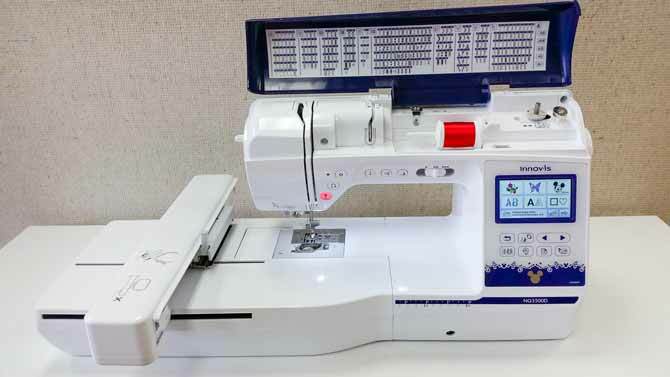 In yesterday’s post, introducing Brother’s NQ3500D sewing, quilting and embroidery machine, I said I’d save embroidery ‘til near the end of the week. But I just couldn’t resist playing in the Brother NQ3500D’s embroidery mode last night… and I can already tell that this is going to be my most favorite part of the machine. I’m so excited about it that I just had to rearrange my original agenda and share my discoveries with you today, rather than later in the week. So having poked around for a while (okay, extensively and into the wee hours), I’m already fancying myself an expert and want to create a little project with you. My inspiration comes from a quilt my mom made years ago for one of my daughters. It actually already has a label, but I’m going to borrow from her creativity here to show you how easy it is to create a custom quilt label by combining and editing text and designs, tweaking and playing until it’s just right! First, though, I’m going to start by pretending some semblance of calm, and show you what the NQ3500D looks like with the embroidery arm attached. Two embroidery hoops are included with this machine, the one is just over 5” x 7” and the larger one is about 6” x 10”. Plenty of room to grow! I’ve already gotten ready to play: I wound a bobbin with bobbin fill and set it in the bobbin case, and I’ve hooped a stabilized piece of quilting cotton in the 5” x 7” hoop. I slid the hoop onto the machine and I just love how foolproof that is! No frustrating clips, just slide and latch. 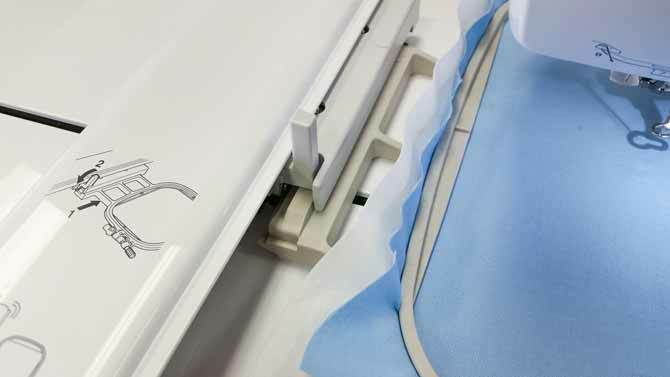 The slide-on embroidery hoops of the NQ3500D are so incredibly hassle-free. Gotta love this! The NQ3500D’s embroidery home screen shows its main categories of built-in designs. 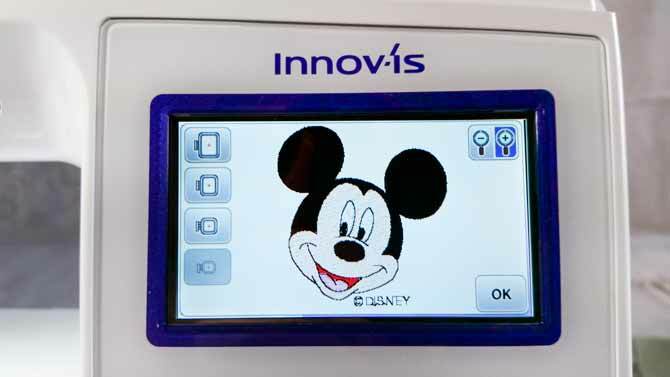 By the way, the “D” in NQ3500D stands for Disney, and this is one of Brother’s line-up of machines licensed for Disney embroidery. Brother’s specs tell me that there are 173 built-in designs, and 35 of those are Disney designs! There are 11 fonts, 1 large monogram alphabet, 140 possible frame design combinations, and a USB key port for adding and saving your own designs, as well as a built-in memory bank to store your favorites. The NQ3500D reads PES and DST design formats. The embroidery home screen is clean and uncluttered, offering unmistakable design selection options. Browsing the built-in designs is really easy – even though the pictures are small, there’s a preview button that shows a close-up view. The design preview button opens this full-screen view of the selected design, with the option to view the design in a particular hoop. I can display my chosen hoop, the 5” x 7” on screen to give me some visual boundaries, and can even set the display to enlarge it to see it better. I think I’ve found the perfect design to complement my label. Once it’s selected and set, you can see some of the tools that give this machine such great editing power. The design editing screen offers lots of editing tools that easily let you combine and customize designs! The ADD button lets me easily select more elements to really personalize my label. Text time! Among the 11 fonts, there’s an awesome array of character choices: upper and lower-case letters, numbers, punctuation, and accent characters. But entering them is a little cumbersome. I can’t see the whole alphabet on screen, so I have to use the scroll arrows to go back and forth to enter my message. I’d love to see this with a QWERTY keypad option – that would make text entry so much quicker! But I do like the “next line” key so I can enter all my text at once. That’s really neat! An example of the options available during text entry – the “return key” symbol lets you enter all of lines of text at once. Once the text is entered, pressing the check button will let you see all of the text entered – a way of proof-reading. It’s definitely handy; I ended up going back to make some corrections. Now, it’s time to play with the design. Because Brother lets you resize text after it’s entered, I’ve gotten in the habit of entering large strings of text in size small, then enlarging and rotating it to fit. After setting the text, I can see what the whole design combination looks like so far. 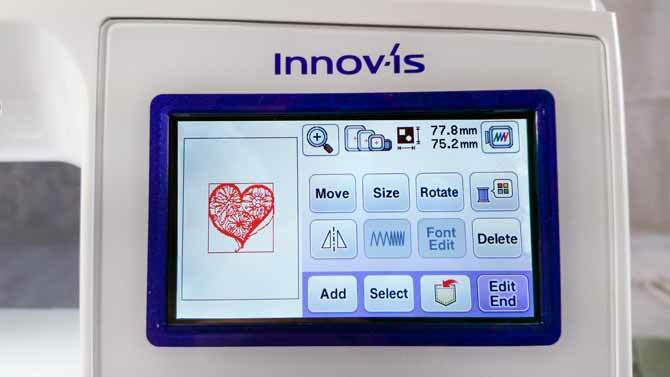 After selecting the heart and sizing it down a bit (as with most machines, there are limited design-sizing options), I dragged it – yes, dragged – it down to the bottom corner! Drag-and-drop is such an easy way to arrange, and of course, there are still arrow keys for precision fine-tuning. What’s even cooler here is the Font Edit button, which lets you change to another font style – without having to type it in again! So I’ve selected each line of text in turn, moved it around and played with the size and font style until I had just the look I wanted. I even replaced a line altogether because I changed my mind, and split another single line into two. All of the tools are intuitive and easy to use, so the learning curve is almost non-existent. The hardest part was making up my own mind! My quilt label, after playing with several of the editing tools. This one is almost ready to stitch, but before I do, I want to play with color. Of course, I can just use whatever colors I want during stitch out, but setting them now with the thread palette button lets me set my color choices and breaks on screen to remind me of what I wanted during the design stage, so I don’t make an oopsie if I get distracted while embroidering this out. Of course, after doing that I couldn’t resist a few more tweaks! A final preview of my ready-to-stitch quilt label, arranged and colored to match my original vision. Back in the editing screen, touching the pocket icon saves the design to the machine’s memory, or to a USB stick if desired. Edit End leads to the next step, a screen for adjusting to the overall position and rotation of the design. In this positioning screen, design elements are grouped and you can adjust the design’s final stitching location. The Embroidery button leads you to the screen that offers all of the stitching information and tools you need to embroider this out: stitch count, time, and color changes! By default, the color numbers were shown as the Brother brand thread color numbers, but you can change that in the machine settings to display a color name, instead. 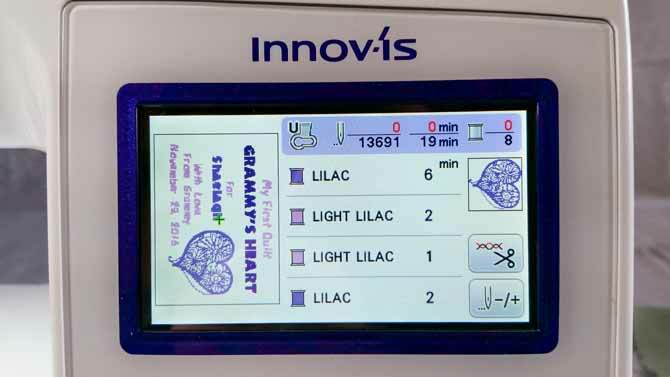 There’s even a stitch control panel – the button is in the bottom right corner – that lets you back up or forward to a desired stitch, by 1, 10, or 100 stitches at a time – even a whole color! This is handy, of course, if you break a thread or want to re-stitch or skip a portion of your design. This screen offers to-the-stitch control when backing up or forwarding your way through a design. Watching this machine stitch out my design, I have to say that I loved that needle threader; it really makes multiple thread changes painless! And this machine is sooo quiet; I wasn’t the only one to make that comment while I watched this design come to life. I ran the machine during a class at work, and my students were impressed by its smooth, quiet operation. Okay – the trial stitch out is complete, and I think it looks pretty great, don’t you? It’s certainly good enough to be the real thing! I see I still have some thread trimming to do, but the machine did cut the thread at the end of every color for me. The stitching time on screen predicted 19 minutes, and in reality it took about 30 minutes. Pretty much on target, considering that the stitching time calculation didn’t include the 8 thread changes my arrangement called for (better pre-planning my color choices could have dropped that down to 3). All in all, I’m pretty excited about the possibilities the NQ3500D opens up. 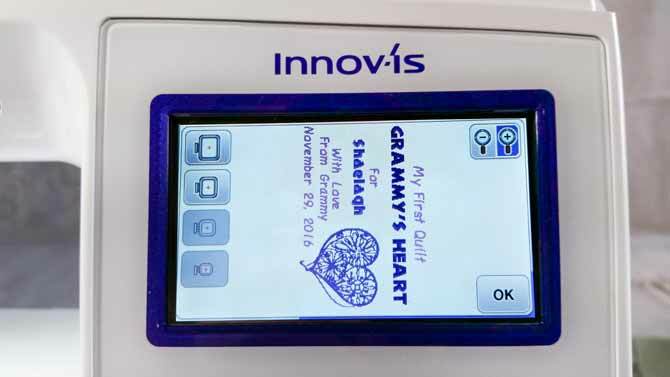 I understand that a lot of the features I explored can be found on a number of Brother’s newer embroidery machines, so I’m eager to explore more of their line-up. I hope you’ve had fun exploring the Brother embroidery environment with me today. I can’t wait to play more! I do hope you’ll join me tomorrow… I’m going to delve into the decorative stitches on the Brother NQ3500D and I plan to create a stitch sensation! Liana Kirkey is an educator and self-professed gadget-girl with 35 years experience in the retail sewing industry. 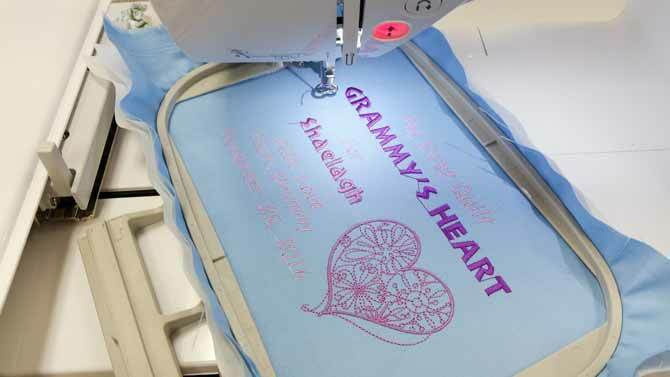 Her favorite sewing playground includes embroidery machines, digitizing software, machine accessories and presser feet. She currently works full-time at That Sewing Place in Newmarket, Ontario. I never thought the Brother NQ3500D would end up being such a good embroidery machine. I wish we had a dealer in our area. Thanks for the tips and machine reviews! Glad you enjoyed the article, Cindy; thanks for reading! I love to make quilt labels with my embroidery machine! What fun that you can put all that together right on the machine. Playing with these machines truly is fun, Marilyn! Officially, it’s my job, but just between you and me, I don’t get nearly enough opportunity to play! These machines certainly are getting more and more capable, creating so many opportunities for personalized and professional results! Thanks for reading and for taking the time to comment.